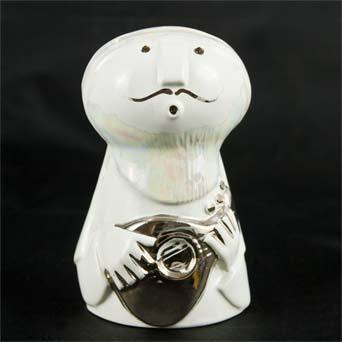 Kenneth Townsend musician moneybox - 4½" (114 mm) high. This was made at Kenneth's brother Dennis's Iden Pottery. Mother-of-pearl glaze is on the body and platinum glaze on the lute. It even has the trace of a Townsend thumbprint!